The PA419-02 is the first portable PA with Bluetooth and NFC (Near Field Communications) wireless capabilities. Now you can stream audio from your own downloaded playlist or Pandora and Spotify when connected to the internet. Play music from the built-in USB or SD card slots for groups up to 300 people both indoor/outdoors or in rooms up to 2,000 square feet through its powerful 30-watt speaker. 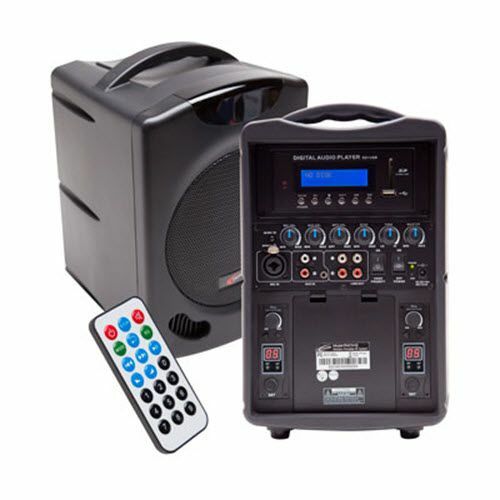 The PA419-02 comes with one or two wireless mics (handheld or hands free) or is available by itself. There's even an additional system that can send wireless audio 150' from an anchored audio source (such as a desktop computer) to the PA419-02.